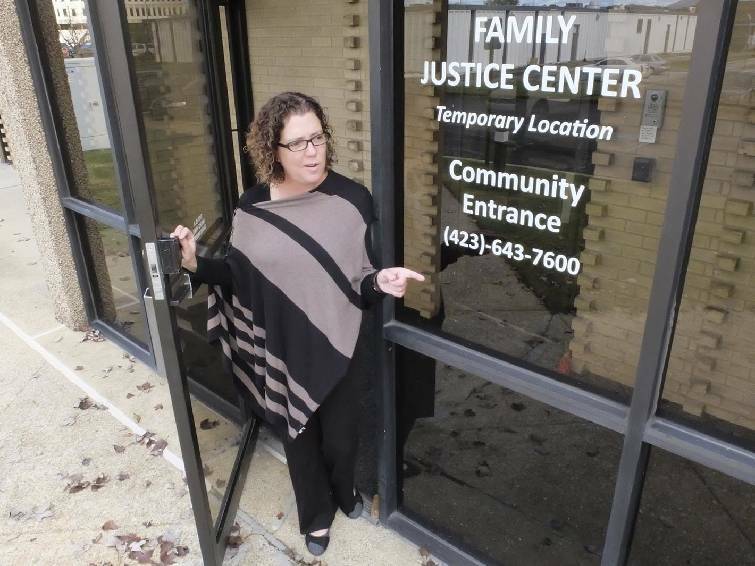 Valerie Radu, executive director of the Family Justice Center, helps families with domestic violence at the offices in the Eastgate area. Exactly 201 days ago, Holly Anderson stared down the barrel of a shotgun as her estranged husband pulled the trigger at point-blank range. The first two shots ripped through her legs. Then Jeffery Held, 38, pressed the gun to his own head and pulled the trigger a third time. He died there, in the parking lot of a Collegedale shopping center on April 26. "I'm alive," she said Wednesday. "That in itself is a freaking miracle. Even to this day when I think about it, I'm like, 'How did I even survive that?'" Doctors managed to avoid amputating Anderson's legs, but the wounds were severe. She's gone through 10 surgeries, and still needs help cooking and showering. She can stand up for only a few minutes at a time before she's completely exhausted, uses crutches to walk and is hoping to be able to walk unassisted by August 2016. She went from working full-time to getting out of bed once a day, only to get right back in. And that's on the good days. "I'm getting better, though," Anderson said. "I try not to wake up every day and dwell on it." She knows, looking back, that she could easily have lost her life. She could have easily been another one of Tennessee's murder-suicide victims. Both Tennessee and Georgia are among the top eight states in the nation for the frequency of murder-suicides, according to a new report by the Violence Policy Center, a Washington, D.C.-based nonprofit that conducts research, education and advocacy to reduce gun death and injury. Data for the first six months of 2014 counted 282 murder-suicide events in the United States that resulted in 617 deaths. There were 285 suicides connected to 332 homicides, the report found. Twenty-six of those incidents happened close by in Tennessee and Georgia. Three days before Anderson was shot, a man shot and killed his estranged lover, his 8-year-old son and himself at a gas station in Varnell, Ga. And on May 8, a Hixson man killed his long-time girlfriend and then himself in their home. As those cases suggest, the majority of murder-suicides — 72 percent — involve an intimate partner, the Violence Policy Center report found. Of the offenders, 89 percent were males who acted alone. Chronic domestic violence can escalate into a murder-suicide, said Valerie Radu, executive director of the Family Justice Center. But not all murder-suicides involve domestic violence, and there is no surefire way for anyone to recognize that a person may soon commit a murder-suicide. Warning signs aren't always clear. "It's important to remember that there can be drugs and alcohol involved, there could be mental health issues involved — when you add that to the mix it can be very lethal," she said. "People can live next door to someone and not have a clue." During the first half of 2014, 93 percent of all murder-suicides were committed with firearms, according to the Violence Policy Center report. After she was shot, Anderson found out Held had bought the shotgun and ammunition he used from a Hixson Wal-Mart the morning of the attack. She wonders if the ease of buying a gun plays into Tennessee's murder-suicide pace. "I'm Southern; I've lived here my whole life. I'm proud of the fact we go out and hunt and fish," she said. "But for someone to walk into Wal-Mart and buy a 12-gauge shotgun, it confused me that we allow that, considering that we are one of the highest for murder-suicide. Are people not listening? Are they not paying attention? Do they not see what is going on?" As she fights to recover, Anderson said the knowledge that her situation is temporary keeps her going. "A few years from now this will just be a bad memory," she said.